Engine Pro Sprints On Dirt presented by ARP new Hoosier spec tires impress! Erie, MI (May 31, 2016) – Last September, when SOD announced its new Hoosier spec tires, there were numerous dire predictions of disaster and mayhem. Now that a week has gone by since the opening races, one on the biggest, fastest track and the other on a high banked 3/8 mile, how did the predictions fare? Well, not very well, actually terrible! Not one of the negative predictions came close to becoming reality. The fast-car dash on the big, fast Hartford Speedway was an exciting duel between Brian Smith’s 410 and Ryan Ruhl’s 360. They raced side by side racing, Ruhl passed Smith for the lead, but a bobble out of turn 2 gave Smith a final shot at regaining the lead and he took advantage of it and drove off to the win. The feature quickly put to rest the prediction that a 360 wouldn’t beat a 410 regardless of the tires. Once again, contrary to popular opinion, Ruhl’s 360 not only won, but dominated the caution-free race. Then, at Butler, 410s finish first and second, but a 360 finished third, passing more cars that anyone else in the feature. It does appear as if SOD has delivered engine parity as promised. 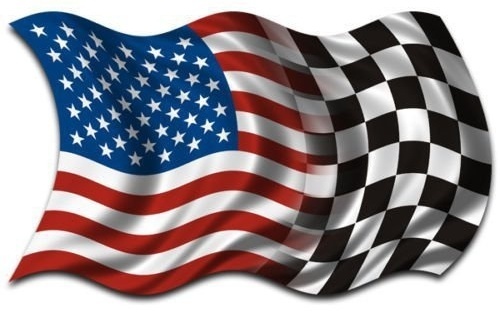 Both nights had exciting racing and did not deliver on the prediction that racing on the new tires would be full of crashes. Drivers quickly adapted to the new tires and became comfortable with them. Originally leery of the new tires, numerous drivers gave rave reviews after using them. 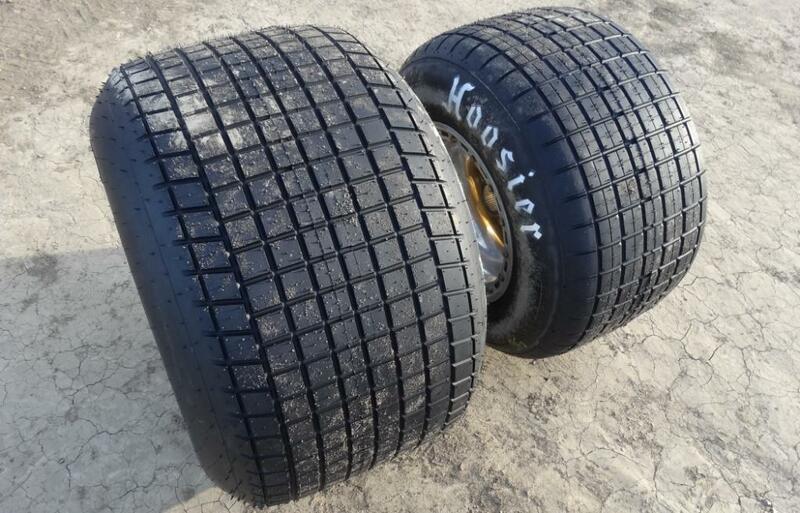 Consistent with what Hoosier Racing Tire and SOD had told racers all along, the top finisher both nights opted to use standard right rear (17”) and left rear (15”) wheel widths even though some had narrower wheels ready to use. Tire temperatures, as monitored by Hoosier Racing Tire, were well within the optimal range for top performance. As with any racing tire, tire management is the key to success and air pressure requirements, whether or not to sipe the tires, etc. are all important factors in getting the most out of the new tires. So why was the racing so good on the new SOD tires? Maybe the drivers who had the courage to give them a try are more skillful than people give them credit for. Or maybe the Hoosier Racing Tire engineers were more than capable of transforming SOD’s requirements into a top performing reality. Both probably contributed to the successful debut of the tires. Competitors are comfortable with the new SOD tires and are saving 10% per set compared to last year’s tires and tires being run elsewhere. Yes, there was plenty of talk about the Engine Pro Sprints On Dirt presented by ARP Hartford and Butler races, but none of it had to do with the tires. Fans will long remember the great racing they saw the first time SOD went beyond limits. The spec tires are destined to have a significant impact on the sport of sprint car racing for years to come. all so that we can now do what we like to do. May our heroes rest in the peace of God. 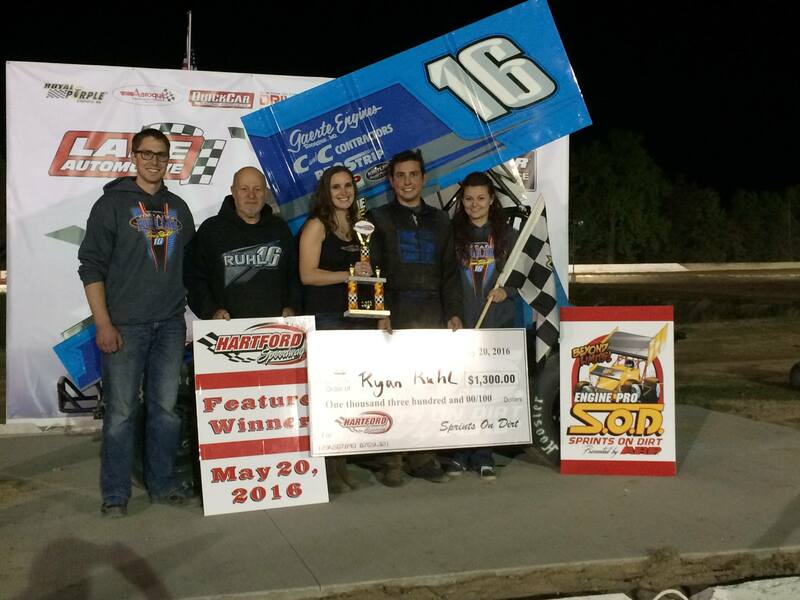 Hartford, MI – (Friday May 20, 2016) – Ryan Ruhl kicked off the 2016 Engine Pro Sprints on Dirt presented by ARP season with a spectacular, rim riding display in route to a dominating feature win Friday night at Hartford Motor Speedway. Ruhl from Coldwater, Michigan started on the front row and drove away just inches from Hartford’s unforgiving concrete wall every lap in route to the victory. For Ruhl the dominating victory was a bit of a surprise considering Hartford’s size and utilizing his 360 cubic inch engine against a number of cars with larger power plants. Dash winner and RockAuto.com SOD Series Rookie of the Year candidate Brian Smith started on the front row for the 20-lap main event. Smith got the jump initially at the start before Ruhl gained momentum through turns one and two to take the lead coming off turn two. Behind Ruhl and Smith Jay Steinebach and Steve Irwin raced for the third spot with Irwin getting a run on Steinebach off turn four on the bottom of the speedway to take away the second position. Ruhl had motored away to a straightaway lead until encountering a group of slower cars on lap 13. This allowed Smith to close briefly until Ruhl found an opening around the slower cars and motored away. From there it was all Ruhl in dominating fashion lapping up to fourth position. Smith claimed the runner up spot with Irwin, Joe Swanson, and Steinebach rounding out the top five. Ruhl and Irwin won the heat race events while Smith won the dash. A-Main (20 Laps): 1. 16 – Ryan Ruhl, 2. 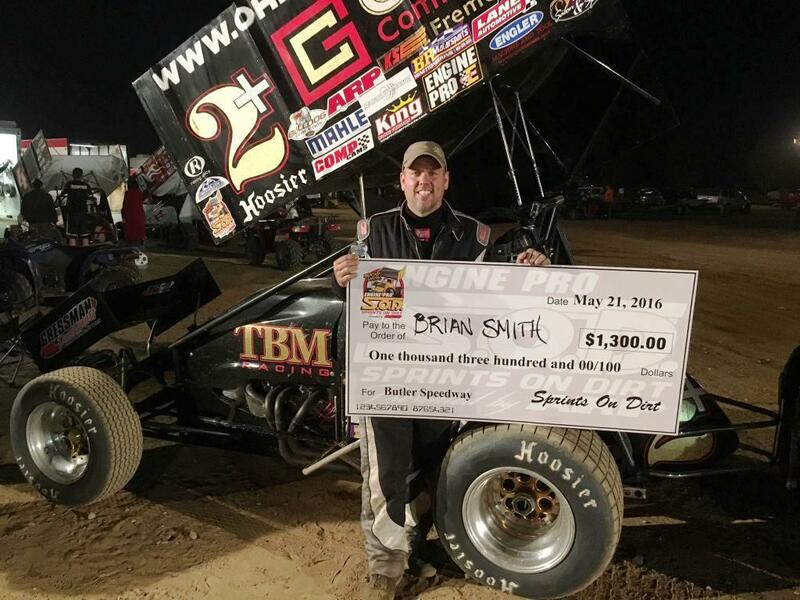 2+ – Brian Smith, 3. 0 – Steve Irwin, 4. 7 – Joe Swanson, 5. 10S – Jay Steinebach, 6. 4T – Josh Turner, 7. 1A – Mark Aldrich, 8. 46 – Robert Huisken, 9. 8 – Justin Ward. 10. 1 – Eric Smith, 11. 19J – Linden Jones. 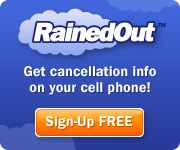 DNS: 7X – Nic Rogers, 49T – Gregg Dalman, 81 – John Gall, 71H – Brad Lamberson, 19 – Brett Mann, 4 – Craig Karazim. Interest in SOD Hartford/Butler weekend tremendous! Erie, MI (May 18) – Engine Pro Sprints On Dirt presented by ARP is heading toward our season opener at Hartford Speedway Friday night with a full head of steam. We are confident that we will finally get our new unlimited format off the ground after two rain outs at Crystal Motor Speedway. Then on Saturday, we move on to Butler Motor Speedway. We are excited to share with you the fact that in just over three days, more than 30,000 people have viewed SOD’s Facebook event post for Hartford. If anyone ever had any doubt about the level of interest in SOD 2016, this answers the question. Reaching 30,000 people did create a little problem for us. We wanted to be sure we shared our sponsor partnerships with everyone viewing our post, so we created an event photo for Hartford that includes all of our sponsor partners’ logos. Since Facebook limits event photo size and we have so many, the images are not as big as we would like, but we did what we could. Both races pay competitors $350 to start the feature.